Dr. Lawrence Sullivan and our team love helping our friends and neighbors develop exceptional dental health, one smile at a time. We know that a great smile begins with great oral health, so we focus on preventive care and minimally-invasive treatments. Ours is a dental practice that is all about you: your dental goals, concerns, and comfort are important to us. We want to deliver the highest level of care, which will have you smiling at the end of every visit. That can only happen if we’re able to exceed your expectations. So we develop individual care plans, based on your unique situation, emphasizing the most efficient and effective solutions. Each of us is a people-person. We love getting to know each of our patients on a personal level, building long-term relationships with them. Our patients are never numbers on a chart to any of us: each is a remarkable individual and someone we consider a friend. We look forward to each person’s visits as a time to catch up on their latest news, and to share more laughter and smiles. 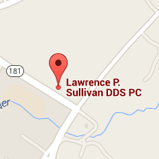 Our family-friendly dental office in Sparta, NJ, welcomes patients from all nearby communities. Dr. Sullivan and our team look forward to meeting you: it will be our pleasure to start you on the path to excellent dental health and amazing, confident smiles! Please, call for an appointment today.